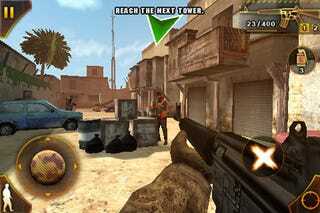 Until such time as publishers like Activision, Rockstar Games and EA Sports bring their top tier games to the iPhone platform, publisher Gameloft will be there to offer something that sounds very similar, like first-person shooter Modern Combat: Sandstorm. The Middle East shooter could easily be mistaken for a Call of Duty: Modern Warfare down port or at the very least a collaboration between Activision and Darude. But it looks feature rich enough to get the job done until such time as Infinity Ward or Treyarch move beyond iPhone apps for their games and start making actual iPhone games. Early reviews on the iTunes Store look to be positive for a $6.99 game. I'm sure Crecente's dropping the cash on it any second now as he can't resist this sort of thing, so don't be surprised if it shows up in a Day Note.